Heat oil on a medium size frying pan at medium-high heat. Add onion and garlic and sauté until soft. Add meat, use a wooden spoon to break it up and cook until it’s no longer pink. Add cumin, paprika, salt, pepper and tomato, mix well. Cook covered for 15 minutes. Add egg and raisins. Microwave sweet potatoes in their bag for 8 minutes. Let cool a little before opening. Cut sweet potatoes in half lengthwise, push in a little bit at the corners until they open up and fill with a little ground beef and top with cheese. Preheat oven to 400° F and bake for 5-10 minutes or until the cheese melts. For a different dish, use turkey, tofu, cod or small shrimp and use sour cream or ricotta instead of cheese. It’s sweet potato season and it’s very likely that you’ll be seeing, and eating more of it in the coming days. It’s usually served as a side on Thanksgiving day, but its use doesn’t have to end there: it can be served as a fried snack, for dessert, as a flan and even in delicious cakes. It’s truly a versatile ingredient! 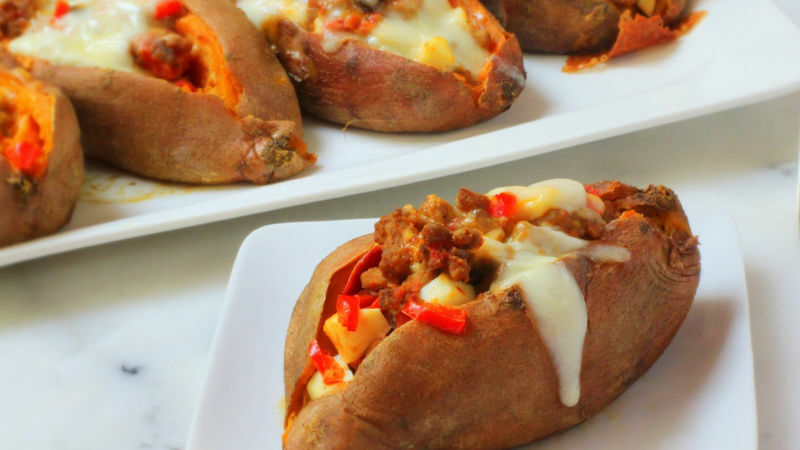 Today, I invite you to try them stuffed with ground beef, eggs and topped with cheese. This perfect combination of sweet and savory will delight you. Try it!